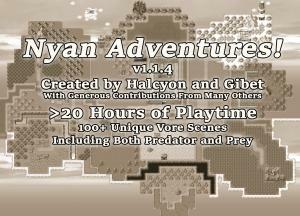 Halcyon's Blog - Nyan Adventures! SURPRISE SPECIAL UPDATE!!! I know I said I was done with Nyan Adventures!, but I just can't seem to let it go! Please check out this NEW UPDATE for November 2018, featuring two major additions: A new pred scene with original art, and the ability to now skip all vore scenes with feral predators! You're welcome :), and please keep making great content! not a problem!! what better way to get updates for a gr8 game (if more updates happen) than to watch its creator? especially when said creator has akari as their pfp! And thank you for making the best RPG game ever! Page generated in 29.6249 miliseconds. 21 Queries.